The Easter course is now finished, and am proud to say that all our students that attended this years course, all worked hard and behaved impeccably. This year the club had its largest contingent attend the course with 19 members, practising Judo, Aikido, and Karate, making up around 10 percent of the course. 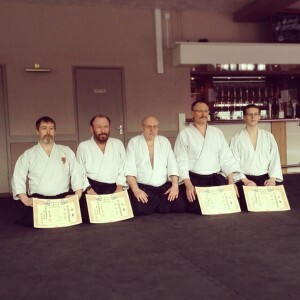 I was extremely surprised and humbled to be awarded my 2nd Dan in Aikido, following this years course we have a few more students that will be taking up Aikido. From my understanding the preparations for next years course are already under way, so lets make next years course even bigger and better. This entry was posted in Uncategorized on April 8, 2013 by Sensei Adrian. Well we are well into this years residential Easter Course. As usual all our students have behaved impeccably, and are all working really hard. At the close of the bank holiday weekend Sensei Adrian was promoted to 2nd Dan Aikido. This entry was posted in Uncategorized on April 3, 2013 by Sensei Adrian.